Patel had a humbling start growing up in India. In a country marred by poverty, disease, and illiteracy in the 60’s and 70’s, he rose up from a small village in Western India to earn his Bachelors of Engineering from SVR College in India in Civil Engineering. At a time when no one thought the young, poor boy from a small village could become an engineer; Raman showed what true hard work and perseverance could achieve. He has used his experiences and same dedication to catapult himself into a class of successful entrepreneurs in Northern California in a time which many doubted the young immigrant, who had high goals and unimaginable dreams. Every barrier that Patel has conquered has taught him something new, and doubt has fed his hunger for more success. It is Raman’s upbringing that has made him who he is today. From the time he first stepped into the Industry 38 years ago, he has worked diligently to learn to ins and outs of the Industry. Starting as an Owner-Operator at a Best Western in Mountain View, California in 1976, Patel has worked nearly every job in and around the property. Knowing each and every job, and experiencing it personally has helped Raman better communicate with all of his staff throughout his various properties. His engineering background played a large role when Patel began developing and building hotels in 1992. He used his skills in valued engineering in new construction when he built his first hotel, Holiday Inn Express in Modesto, California. This Express was the first in Northern California, and was heralded for its design and construction. Intercontinental Hotel Group awarded the property with its coveted New Comer award for Best New Construction in 1993 when the project was completed. The property was also awarded with the Torch Bearer, an award presented to the Top 50 properties in the country in its first full year of operations. With his pristine knowledge and vision for the hotel industry, he was asked to and joined the Holiday Inn Express Owners committee in 1994, becoming instrumental in subtle changes in amenities such as irons, ironing boards, implementing HSIA, etc. that has enhanced the guest experience. This property has since been converted to a Baymont Inn & Suites to make way for another Express which Patel built on an adjacent lot. Patel and his team completely renovated the property converting it to a upper-midscale boutique style hotel. 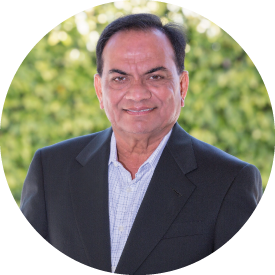 Since his start in the development aspect of the Industry, Patel has gone on to build four more prestigious hotels from ground up in the area with World Renown companies such as IHG, Hilton, Wyndham, and La Quinta. He has maintained these relationships and valued each experience learning something new each time along the way. In the company’s latest project, La Quinta Inn San Jose Airport, Patel played a vital role in structuring and implementing the renovation with value engineering and structural changes. By making these renovations and adding a full bar and lounge, the hotel has re-positioned itself in San Jose’s landscape as the premier upper mid-scale property. Over the years, Patel’s properties have had their fair share of recognition. In addition to the initial Torch Bearer award, Raman’s properties have been awarded four more times. He received the Quality Excellence Award for a Top 50 hotel in the nation for service at the new Holiday Inn & Suites hotel in Modesto. Currently, Raman Patel oversees all the development, renovations, and finance of the company’s hotels. No matter which property you visit, Raman’s distinct taste can be felt at all of Zenique’s properties. The humble boy from India, with high dreams has stayed true to his vision from years ago. He has achieved his goals in instilling his vision on Hotels in the Northern California region by giving his guests the ultimate home away from home experience. However, there is no ceiling for his aspirations as Raman Patel looks to continue adding his mark on the Industry.